Marvel Studios spent a great deal of 2018 celebrating its 10th anniversary, which culminated in the release of Avengers: Infinity War this past summer, preceded by Black Panther and followed by Ant-Man and the Wasp. They also released some pretty cool posters to ring in the occasion. But they’re not done yet. Now, Marvel has unveiled two new posters that celebrate 10 years of heroes and villains. And they are gorgeous. Two officially licensed @MarvelStudios posters of the heroes & villains of “The First Ten Years” have been revealed! The first poster gives us a look at the most popular superheroes in the MCU, with Captain America and Iron Man in the center of this artistic masterwork. Ant-Man sits on Iron Man’s shoulder, as Tony Stark is flanked by War Machine. Perched above them is Black Panther, who finds himself surrounded by Falcon, Thor, Hulk, Doctor Strange and Vision. Taking up the bottom half of the poster are the Guardians of the Galaxy, with Star-Lord in the middle, Drax to his left, Gamora to his right, and Rocket bringing up the bottom. Baby Groot gets his own place just under the poster title. Beneath the Guardians is Black Widow, ready to pounce. She is surrounded by Scarlett Witch and White Wolf on one side, with Nick Fury and Hawkeye on the other. Quicksilver is absent from the poster, as is Captain Marvel. Carol Danvers doesn’t technically make her big screen debut until 2019, the 11th year anniversary of the MCU, so her omission is expected. Also missing is the huge presence of Spider-Man, who may be jointly owned by Sony but became a huge part of this cinematic universe in its later half. Ant-Man’s better half, Wasp, is also suspiciously absent, alongside Nebula. On the ominous villains poster, the biggest of the bad, Thanos, takes complete center stage. He is flanked by Ultron and Loki, with Yellow Jacket sitting on his shoulder. Above him is Ronan the Accuser, who is wedged in the middle of Red Skull and Malekith. The Hulk Buster armor takes over the top portion of the poster. Just underneath Thanos is Iron Man 2 villain Whiplash, who is sharing space with The Incredible Hulk baddie Abomination. Faux Mandarin Trevor Slattery finds himself in the company of Crossbones and Baron Zemo. Also included on the lower half of the poster is Kurt Russell’s Ego the Living Planet, Hela and Killmonger. Getting their own space to breath on the lower half are Kaecilius and Jeff Goldblum as The Grandmaster. The MCU kicked off with 2008’s Iron Man and has been going strong ever since. The first three phases will come to an end this summer with Avengers: Endgame. 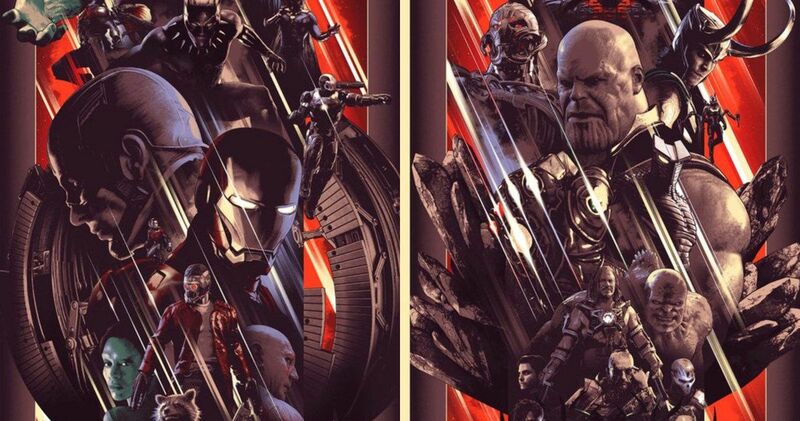 Everything in between is well represented on this pair of posters, which Marvel commissioned from artist John Guydo. These jaw-dropping one-sheets perfectly capture the true essence of the MCU and what the first 10 years have brought. These posters were first revealed on MCU Tweets.